We want to promote one easy message about depositing your work in the research repository and making sure it’s eligible for the next Research Excellence Framework (REF). To help our research-active staff ensure their work is eligible for the next REF, we’re promoting a simple message, ‘Act on acceptance’. 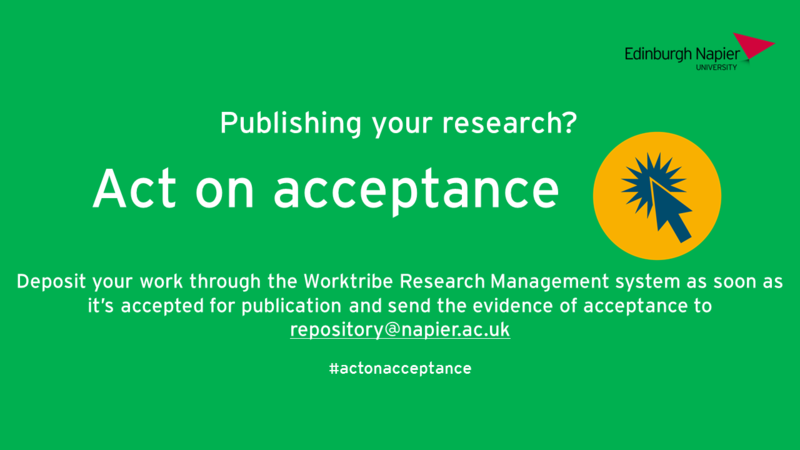 This means that as soon as you’re told your work has been accepted for publication, add it to the research repository and send the evidence of acceptance to repository@napier.ac.uk. Act on acceptance is a simple message about a good habit to get into and one that’s essential for REF eligibility. 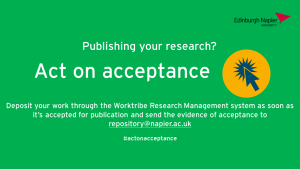 After you’ve deposited your work in the research repository, send the evidence of acceptance to repository@napier.ac.uk and we’ll ‘tie’ this to the deposited record (restricted access).